If you love a nice chicken salad sandwich but are looking to cut carbs and reduce fat, this recipe is for you! This healthier version of chicken salad is perfect for lunch or picnics at the park. 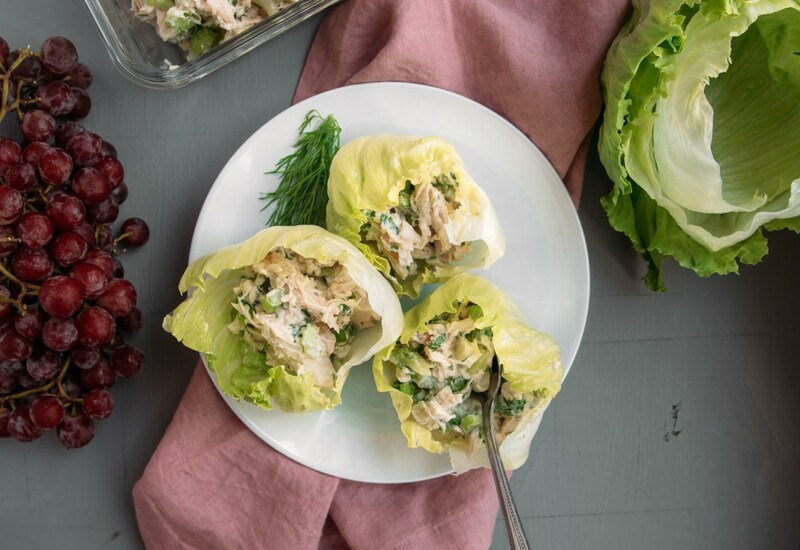 You won’t miss the mayo or the bread thanks to the fresh crispness of the Bibb lettuce leaves. They are also the perfect "cup" shape to hold the moist and delicious chicken salad. Best part is, this recipe is also gluten-free! It is a quick and easy lunch to enjoy on-the-go during a busy work week. This recipe is very versatile. Try adding some mix-ins such as crumbled bacon, diced avocado, shredded carrot, diced cucumber, or diced tomato to make it more interesting! Try adding 1/2 teaspoon (or more) curry powder and slivered almonds for extra flavor and crunch. Or for a sweet and savory twist, try toasted walnuts and grapes. Per Serving: 469 calories; 19g fat; 5.6g carbohydrates; 70g protein; 221mg cholesterol; 897mg sodium. This recipe is a perfect meal prep for lunch. Buying a rotisserie chicken from your local grocery in advanced helps cut down on the cook/prep time. If you cannot find Bibb lettuce, it can be named something different like hydroponic lettuce or Boston lettuce. Either will work perfectly. This is a great a quick to prepare recipe to prepare. These chicken salad cups are really light and delicious. This was my first time making them with Greek yogurt, very good! I added crumbled bacon and diced avocado to these chicken salad cups. They're addicting! I eat them with and without the salad, yum! The only thing that would make this chicken salad taste better would be to add chopped hard boiled eggs. I love the Greek yogurt in this dish, instead of mayonnaise which I would normally use. Bacon and avocado were the perfect addition to this chicken salad. I didn't do salad cups, just ate it right out of the bowl. Adding this to my weekly rotation. The rotisserie chicken was perfect for this.